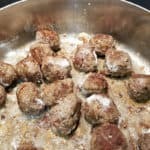 A Swedish meatballs recipe on an Italian website?? 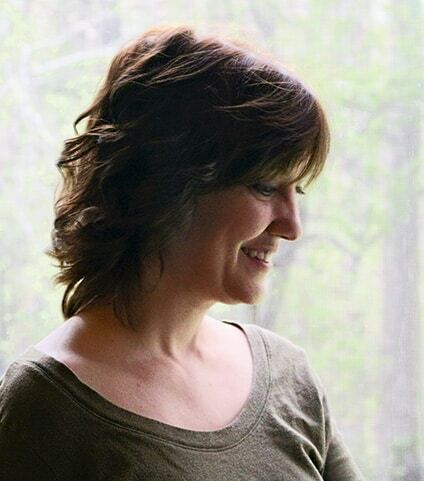 Well, yes, this recipe was so amazing and one that I would classify as a distant cousin to the Italian style meatball and I decided it deserved a place on my website. 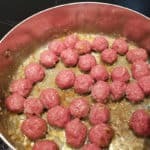 They are still in the same family of meatballs, but a few different ingredients that make them just a bit different than the Italian version. Inspired by my new favorite old cookbook! 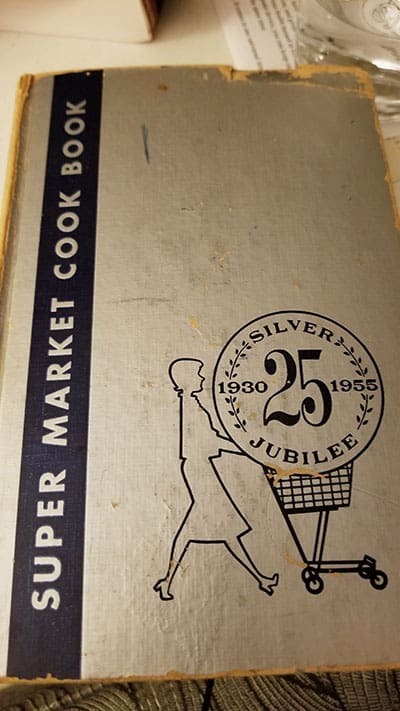 This recipe derives from a 1955 cookbook I found while cleaning out my in-laws house when they were moving. I am fortunate that in their generosity I got this goldmine of a book. So when my husband and I came up with the idea of making Swedish meatballs for the family for our Christmas eve dinner, and spending too much time online looking at recipes, we pulled out our trusted book and decided to use it. 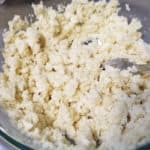 I had no intention of adding the recipe to this site, but they were so amazingly incredible I had to share it right away. In fact, there is footnote on this recipe that it is a recipe directly from Stockholm. So I’m going to provide you the recipe however I’ve had to make some minor changes to quantities due to the original recipe using beef chunks to be run through a grinder at home. I’ve made no changes to the ingredients themselves, but a few things happened that required me to make the quantity adjustments. 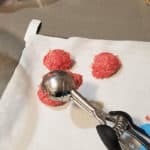 For whatever reason when I used a pound of ground beef instead of the method of using beef chunks that I grind up, the consistency was so extremely moist I couldn’t even form a ball. So I had to add in another pound of beef and another cup of breadcrumbs (un-soaked) to absorb the moistness. Since I basically now doubled the meat, I added more paprika only, but did not add in another egg as that would make it too moist again. For kicks I’m including a photo of the original recipe. Lastly, I made a mistake as you’ll see in my recipe images below, but it actually turned out to be a good thing and I think when I make these again I’ll purposefully make the same mistake next time too. I didn’t add the sauted onions to the meat mixture, but kept it in the pan which then made it’s way into the sauce. I thought this actually tasted great and with the cooking of the onions with the slightly burnt pieces of meat while cooking the flavor was only that more enhanced. But you can do whatever you want, either way it will work. The soft breadcrumbs simply mean they aren’t hard like the kind in the store. I used a loaf of artisan organic bread, cut off the crust and cut it up into small pieces. You’ll see the image in the recipe below. How are Swedish Meatballs Different than Italian Meatballs? The basic difference based on my experience boils down to two things: size and ingredients. Swedish meatballs are about 1/2 the size of a regular meatball (Italians always have to go big don’t they? ), but in Italian meatballs you have ingredients such as garlic, parsley or other Italian herbs, and Italian cheese (Romano is what I use). Swedish meatballs use spices such as paprika and nutmeg. Some recipes use cinnamon, but not the recipe I used. Don’t let those spices scare you, you can’t even really notice them. Both use beef, (yes many Italians also use other meats such as veal and pork which I do not). Both also use breadcrumbs and egg. Soaking breadcrumbs is great and helps keep the meatballs moist, something I’ve never done before. You know it’s funny, my Italian meatball recipe is from my mother-in-law and only recently is she like, “oh yes, you want to soak the breadcrumbs”. Perhaps the Swedes deal with the same thing, there is no “final recipe”, it’s a matter of using what you have on hand, and how much time you even have. Actually, soaking the breadcrumbs is great b/c you don’t have to make your own toasted or dried out crumbs like I show here. The sauce is different too. 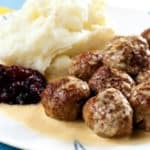 Swedish meatballs use a sauce that is made of milk at the end and turns into a gravy-like sauce due to the flour added to the cooking meatballs. Italians don’t do that. They serve the meatballs with an Italian red sauce made separately. However, both meatballs go great with noodles. For Italians, it’s pasta noodles, for Swedes it’s the wide egg-like noodles. Noodles nonetheless. Is This a Difficult Recipe? 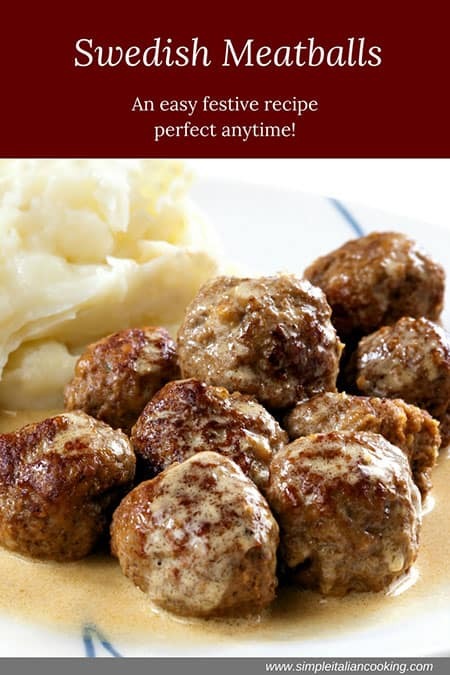 Swedish meatballs are very easy to make and prepare. This was my first time and I was really impressed with myself. This recipe uses a cream sauce at the end that couldn’t be easier. It’s basically a one pot recipe meaning everything is pretty much self-contained. It’s super easy to make otherwise I wouldn’t include it at all. If I can do it and it gets rave reviews in the house, I post it. In fact our first batch I made fit about 22 meatballs (made them too big, so a little larger than the typical small ones), but my husband and I couldn’t stop eating them when they were all done. We were left with 8. Fortunately, I was going to make more than one batch for the family since there will be 18 people, mostly Italian. You can see in the picture, I’m truly enjoying the meatballs! If I look tired, it’s because I am! Ultimately after my multiple batches, I ended up with 160 Swedish meatballs. We froze some plain without sauce, but the rest we’ll be taking to the dinner. Here’s the recipe. I tried to include as many pics as I could so enjoy! A recipe from Sweden modified for today's culinary culture. 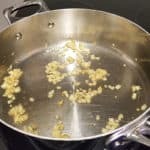 Keeping to the true flavor and techniques in the book, this is a recipe for anyone and good enough to be included on this site. Mix the meat with the spices, egg, breadcrumbs and onion. NOTE: I forgot to add the onion and instead used the onion in the sauce and it was awesome. So if you don't like onion in the meatballs, just leave them in the pan. Form into small balls. I used a cooking scooper then divided htem in half. This made them much easier to keep similar in size. NOTE: The meatball mixture will be moist, but not so much you can't form a ball. Slightly brown the meatballs on all sides. This involves using a spoon or other utensil to turn them as they cook. I found a spoon was easiest to use. When browned on all sides, coat the meatballs in the pan with the flour and cover and cook for 5 minutes. Add the 1/2 cup of rich milk, cover and cook another 5 minutes. Make sure meatballs are cooked all the way through, if not continue cooking. Enjoy and serve warm with sauce. In my pictures you'll see onion in the pan. That's because I made a mistake and forgot to mix it in with the meatballs. It ended up being a good mistake as it added flavor to the sauce even more so. Either way is fine. But the original recipe says to add the onions to the meat mixture. The original recipe called for 1 lb of beef chunks that would be put through a grinder. So I used 1 lb of ground beef at first but it was not enough beef and the mixture was so moist that I could not even form balls. So to compensate I added in more breadcrumbs and another pound of beef. Upped the quantity only of my paprika as I was afraid anymore nutmeg would be too strong. I made these two days in advance. So what I’ll do is put them in a oven dish/pan and add the sauce I had along with a little water to cause a steaming effect when I cover and reheat probably at about 350F. Otherwise, I’d serve the meatballs immediately with a nice salad on the side, some mashed potatoes, root vegetables or cranberries.